By now, we’ve all seen the shocking viral videos. The rage-inducing photos. The fire-and-brimstone calls for a boycott, firings, and someone’s head on a platter—preferably Oscar Munoz’s, if George R.R. Martin has his way (you know it’s bad when the guy that dreamed up the world’s most twisted wedding is outraged by your behavior). First, there was Leggingsgate. Then came the now-infamous denied-boarding fiasco. That was followed by scorpions on a plane, Grandmagate, and an Animal Farm-style story of a passenger downgrade, proving that, truly, “All animals are equal, but some animals are more equal than others.” And speaking of animals, let’s not forget the bizarre death—and subsequent unsanctioned cremation—of the giant rabbit Simon. Oh, and if that weren’t enough, it appears United has something against weddings and honeymoons, too. United, it seems, can’t stop from shooting itself in its proverbial foot. I’m guessing that shortly after those horrific videos, stories, and memes hit the Web and the crises started to mushroom out of control, Pepsi and Sean Spicer heaved a huge sigh of relief, and United’s PR and social media teams made a run for the nearest bar. And, really, who could blame them? The company’s handling of its tsunami of bad PR has been jaw-droppingly, astoundingly awful. Take United’s very first (but now deleted) response to Leggingsgate: “UA shall have the right to refuse passengers if they are not properly clothed via our Contract of Carriage.” Say what? I’m not one to kick anyone when they’re down, but when bad news travels at bullet-train speed and everyone is armed with a camera capable of capturing provocative images and video, United should’ve known better. This no blushing neophyte in the rough-and-tumble world of modern day crisis communications; rather, this is a veteran brand that has endured a turbulent merger and withstood passenger anger over shrinking seat sizes, vanishing amenities, and the introduction of an avalanche of new fees. Heck, CEO Munoz was even recognized as Communicator of the Year by venerable trade pub PRWeek, an honor it’s now rethinking. 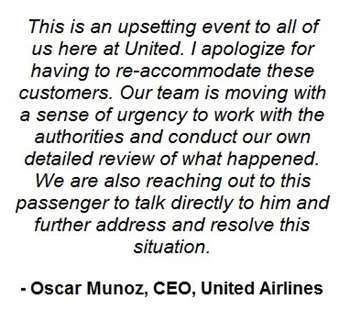 It looks as if United has forgotten the PR 101 foundations of managing crisis communications—transparency, responsibility, and the art of the apology. How differently would the dragging incident have unfolded if the airline had simply stepped up and said, “I’m sorry”? It could have prevented the situation from turning as dumpster fire ugly as it did. I can hear the squawking coming from Legal already. An apology is an admission of guilt! Liability! We must minimize our exposure! Protect the company at all costs! Don’t get me wrong, Legal absolutely needs a seat at the crisis-comms table. Its counsel is required so that Marketing, PR, and Social Media can do their jobs effectively, without landing the organization deeper into hot water. On the flip side, though, Legal must give communications teams room to maneuver. Marketing, PR, and Social Media cannot respond adequately if shackled by mealy-mouthed legalese meant to deflect blame. To truly succeed, a crisis response has to be a joint effort between communications and Legal. Together, both sides of the table can come up with a strong strategy that addresses the situation while protecting brand integrity and value. 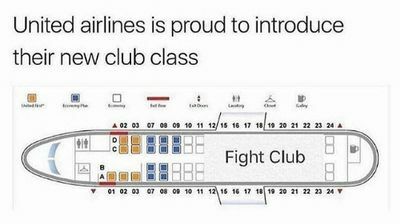 So, what lessons can we learn from United’s ongoing struggle? Situational awareness. How can you tell when a problem will spiral into a full-blown crisis? By listening. Whether it’s mining emotional intelligence through social listening tools or something as simple as setting up a Google alert for select keywords and phrases, knowing what’s being said about your brand is critical. And don’t forget your secret weapon: frontline employees. Often the first point of contact, customer-facing employees can provide a wealth of information on real-time developments and sentiment. Make sure they have a way of quickly getting essential information to the right people in your organization, and feel empowered to do so. And that leads to my next recommendation. Educate off-hours personnel and keep your “A Team” on call. Customer service and brand management are 24/7 jobs these days. Several of United’s troubles befell it during off-hours—at night and on weekends—when key personnel weren’t around. The first Leggingsgate response is telling; it was a by-the-book recitation of company policy that merely served to reinforce a negative image of an uncaring corporation. Why didn’t “FS,” the person who signed those initial tweets, alert key stakeholders within United’s communications team to the unfolding drama? Did this employee not know or not have the resources needed, to escalate the situation within the organization? Nobody likes having dinner or the weekend interrupted, but it’s far better to head an impending crisis off at the pass than deal with the carnage afterward. Keep those internal lines of communications open, and make sure everyone knows whom to call with an SOS. Push the “Pause” button. Once you’re alerted to the situation, don’t wait to get a statement out there. Give yourself some breathing room by publicly acknowledging that you’re aware something happened, but details are still being gathered and you’ll have a more in-depth response shortly. Getting a brief holding statement published will buy you the time needed to get all the important players—PR, Marketing, Legal, IR, HR, Customer Service, and the C-suite—to the table to formulate a strategic response. Manage the narrative. When crafting that strategic response, remember these vital words: transparency, responsibility, and empathy. This isn’t the time to shoot from the lip, so choose your words carefully. When you do offer your mea culpa, make it meaningful. Don’t use weasel words like “re-accommodate,” or shift blame elsewhere (or, worse, blame those wronged), or issue a tone-deaf “sorry not sorry” apology. Take ownership of the mistake, be genuine, empathize with those affected, and give your apology once. Apologizing repeatedly won’t help your case; it’ll just call the authenticity of your previous statements into question. Do remember to address the problem with your internal audiences, as well. Your frontline employees will be dealing with the fallout, so equip them with the knowledge they need to positively manage day-to-day customer communications. Explain the situation and provide guidance or talking points to help minimize missteps. Remind everyone what can and cannot be shared on social media. And if you do decide to issue an internal memo about the matter, hear me now: “It. Will. Leak.” Don’t undermine your crisis strategy by penning a memo that refutes your public apology. Crisis communications is not for the faint of heart. But, by remembering your marketing, PR, and social media fundamentals, your organization can weather the storm. 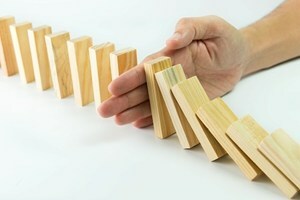 Handle the crisis well, and your brand might even win a few brownie points with key audiences. Oh, and by the way? I hear United is looking for a new PR manager.